Robert Farrington Elwell was born August 24, 1874 in Boston, Massachusetts. His 24-year-old father, Albion Elwell, was from New Hampshire, and his 23-year-old mother, Alice Farrington, was from Massachusetts. He was an only child. They lived at 5 Oakville Avenue. His father was a stone mason. He studied at a local technical school to become a civil engineer, which taught him skills in drafting and lettering. He began his career as a letterer and graphic artist at The Boston Globe newspaper. In 1892 he met William F. "Buffalo Bill" Cody when his famous Wild West Show visited Boston. 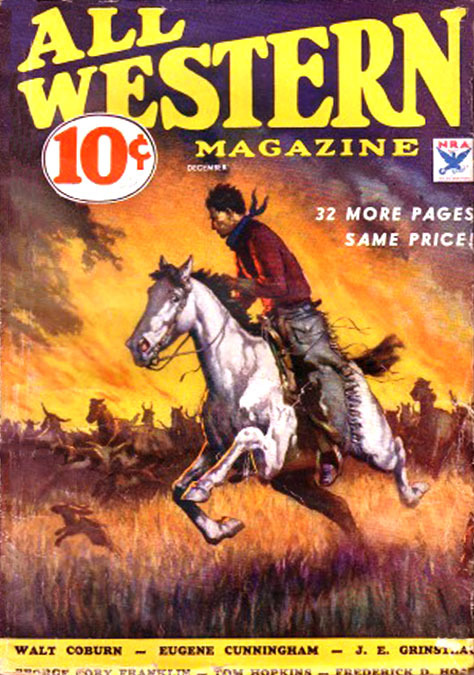 Elwell illustrated some of the advertising and publicity that Cody arranged with The Boston Globe. He and Cody became good friends. According to the artist,"I was associated with Cody for many years in as close a relationship as father and son." 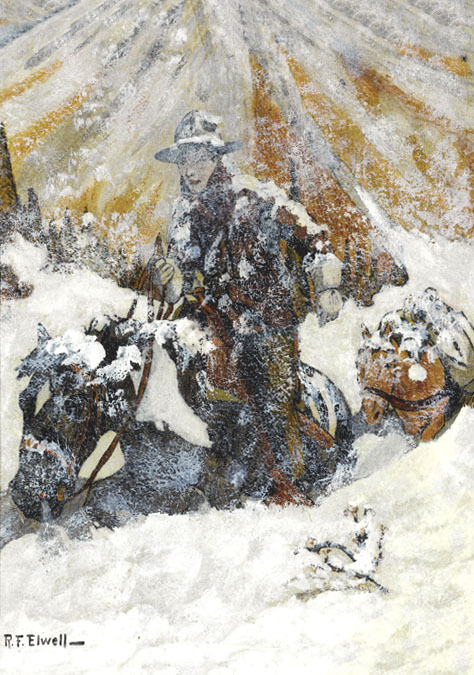 Cody invited the young artist to visit his Montana ranch during the winter to escape the frozen New England weather. In 1896 he began to contribute some of his training as a civil engineer to the management of a development project at Cody's Ranch. In 1897 he married his wife, Mary Ellen Taylor, who in 1882 had emigrated from England with her parents at the age of seven. At first they lived at her parents house at 66 Rosemary Street in Needham Township, MA. In 1898 their first child, Alice M. Elwell was born and three years later Grace I. Elwell was born. 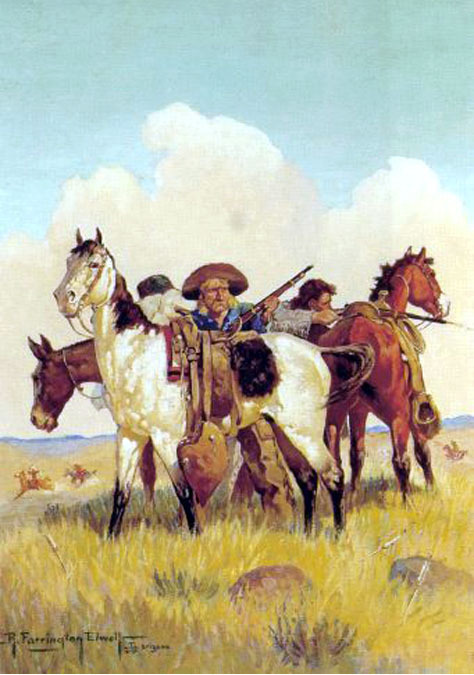 Through his association with Cody, he became acquainted with Frederic Remington, Diamond Jim Brady, Teddy Roosevelt, Chief Iron Tail, and Annie Oakley, who taught his daughter how to shoot. 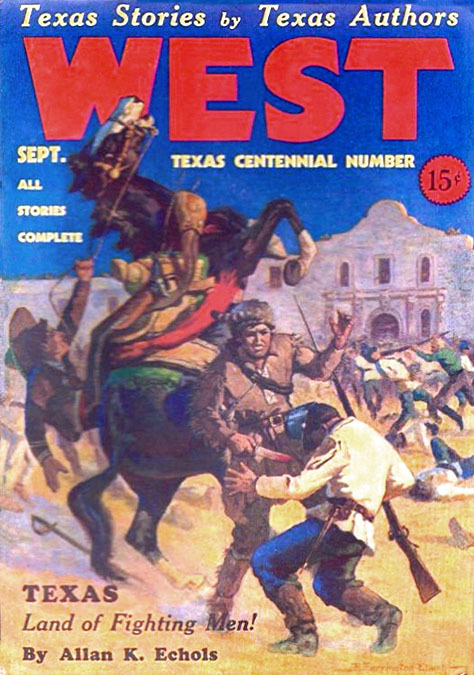 During the first two decades of the 20th century he illustrated several books about soldiers, Indians and cowboys for young readers, such as Born to the Blue, The Boy Who Won, and The Girl From Big Horn Country. On September 12, 1918 he reported for draft registration in the World War. He was recorded to be tall, medium build, with blue eyes and brown hair. 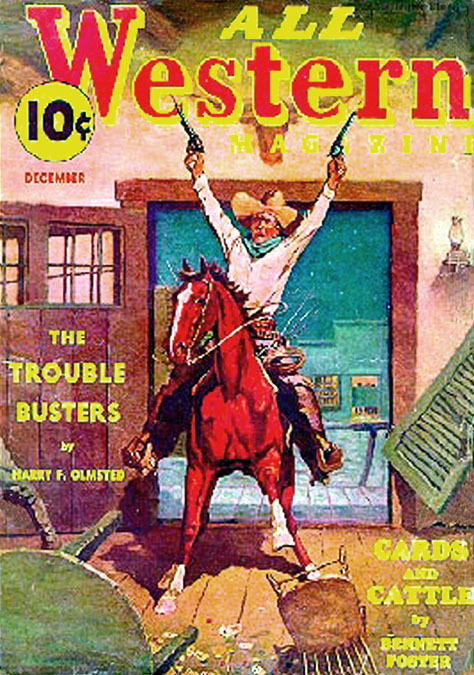 His occupation was listed as magazine artist and writer. He did not serve in the military, because he was 44 with a wife and two daughters. In 1920 he lived in a home that he owned on Haven Street in Needham, MA. His daughters Alice M. Elwell (21) and Grace I. Elwell (18) both lived at home. 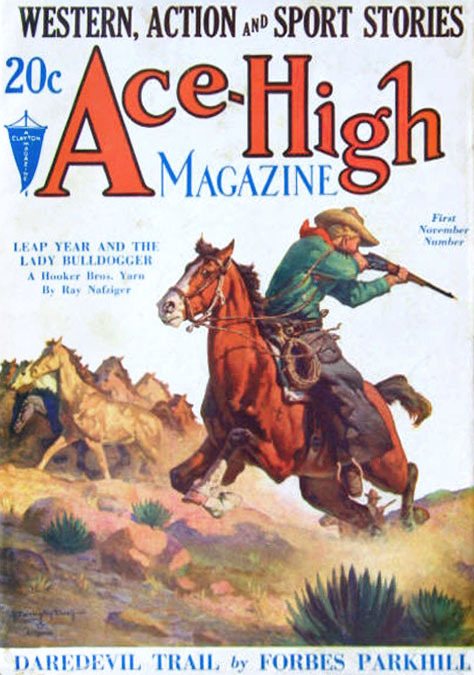 During the 1920s he drew black and white interior pen & ink illustrations for Harper's, Century Magazine, American Magazine, and The Outing Magazine. 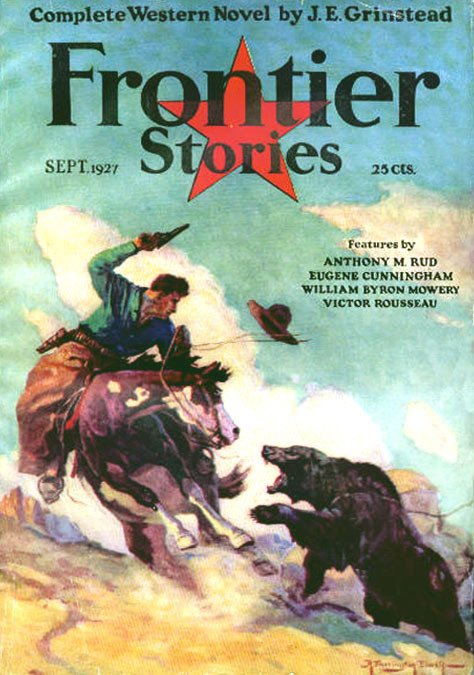 He also drew interiors as well as painted covers for pulp magazines such as Frank Leslie's Popular Monthly, Adventure, West, Short Stories, and Frontier Stories. By 1930 his daughters had married, and he and his wife had found a winter home in the South West in cattle grazing land. 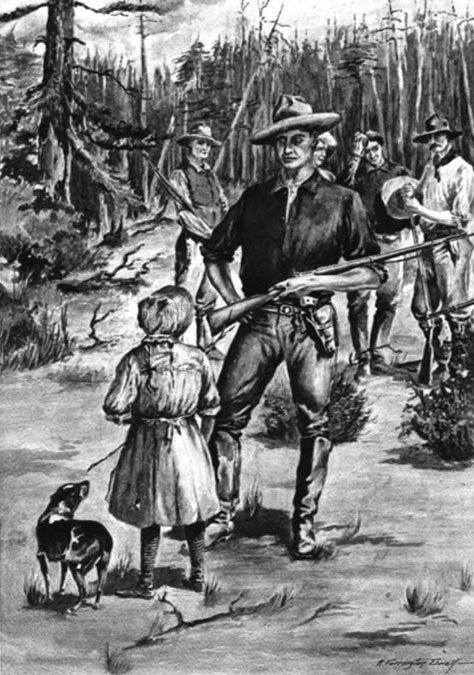 They lived on Camp Wood Road, near Bagdad, Arizona, just West of the Prescott National Forest. 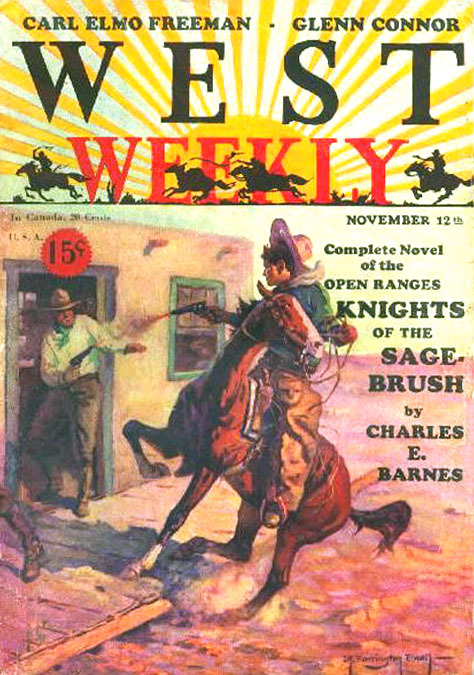 He painted scenes of the Old West and he continued to sell freelance illustrations to pulp Western magazines, such as All Western, Ace-High, Short Stories, and West. 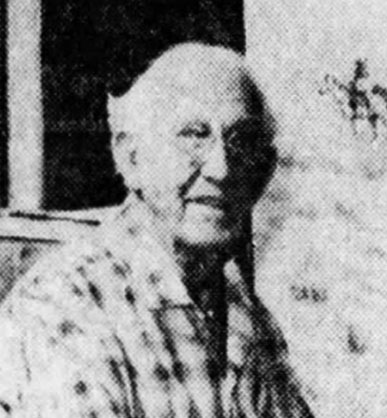 During World War II he was 69, which was too old to register for military service or even volunteer. 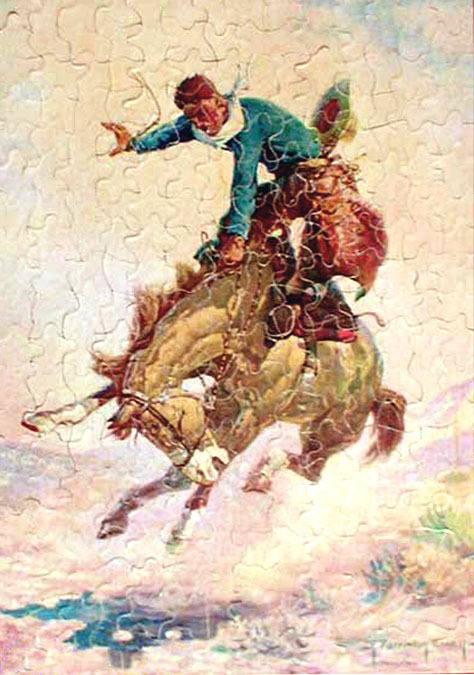 After the war he left his primary residence in Massachusetts and moved year round to Wickenberg, Arizona, where he worked as an art teacher for Remuda Ranch. 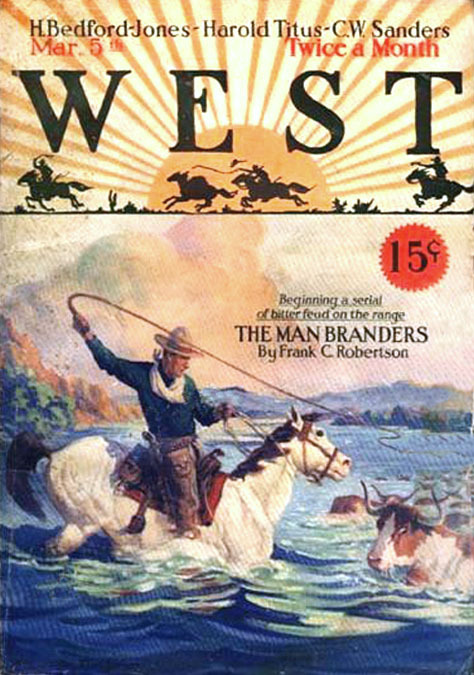 He also made paintings of the Old West for art galleries. 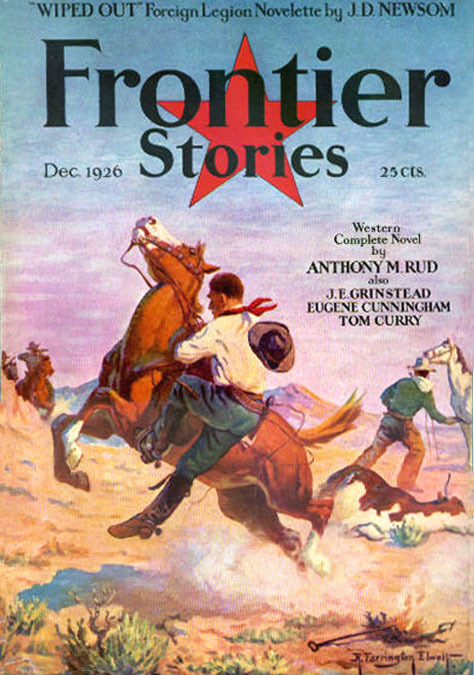 In the 1950s he illustrated interior stories for the popular mainstream magazine, Arizona Highways. 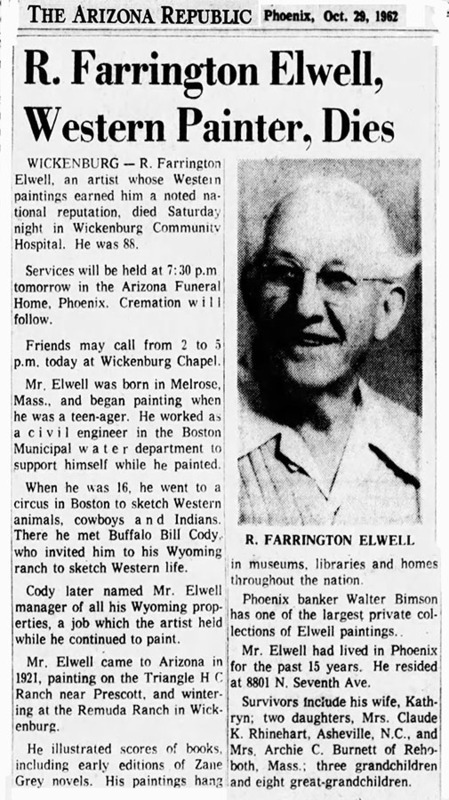 R. Farrington Elwell died in Phoenix, AZ, at the age of eighty-eight on October 1, 1962.